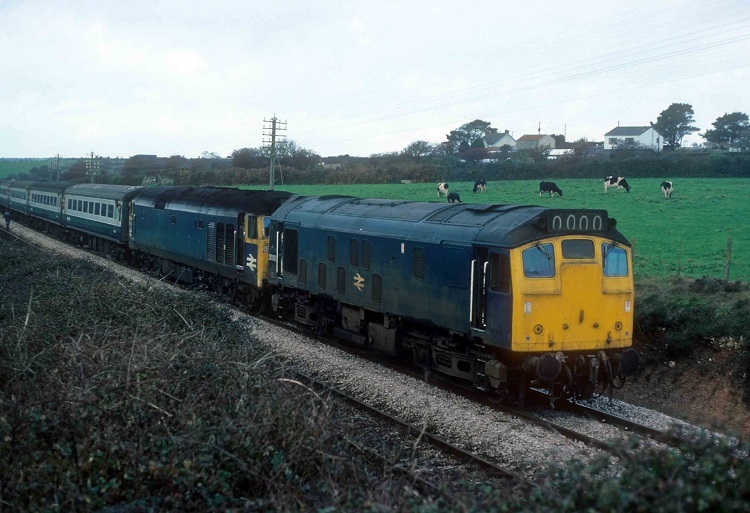 Photograph courtesy Roger Geach 25063 comes to the assistance of an ailing 50017 working the 10.05 Penzance - Paddington, seen here near Chacewater on November 14th 1976. The seventeen year and five month service career of D5213/25063 was split between London Midland & Western Region allocations. August 1963 to Cricklewood (14A). January 1965 to London (Midland) Division (D14). June 1968 to London (Western Lines) Division (D01). January 1972 to Newport Ebbw Junction (86B). July 1972 to Bristol (82A). 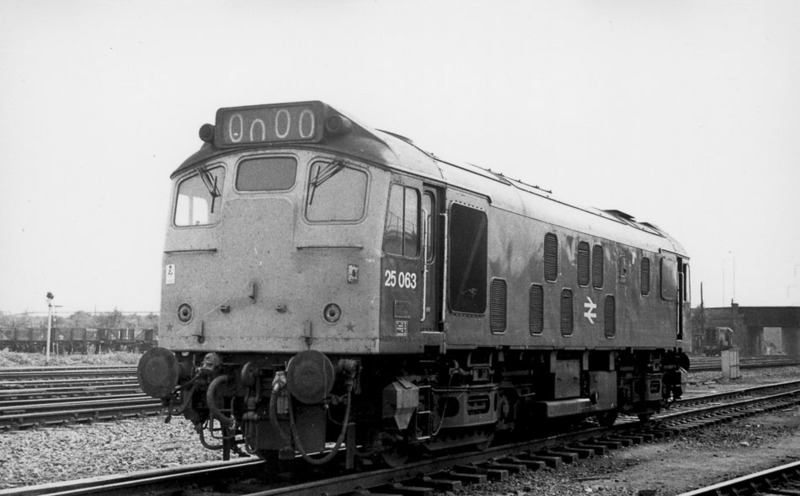 25063 was the 54th Class 25 withdrawn, one of seventeen withdrawn during November 1980. After withdrawal 25063 was moved to Swindon Works by December 19th 1980 and broken up there during the first week of March 1983. 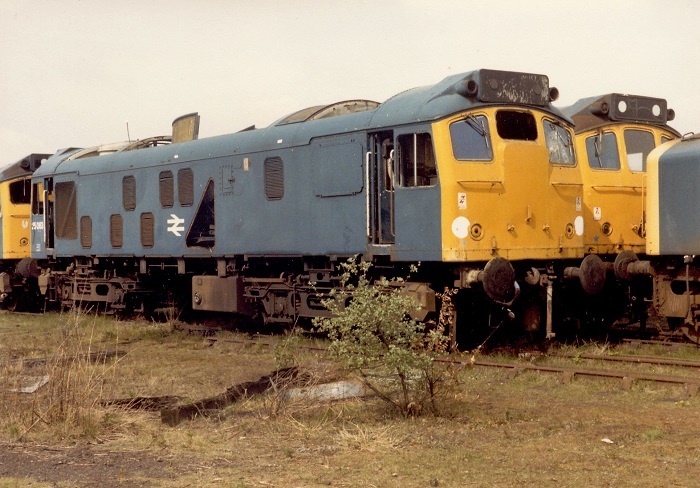 Photograph courtesy Jerry Glover 25063 at Swindon Works on April 26th 1982. The locomotive displays the cabfront white circles and the non-standard headcode panel. Noted Crewe Works July 1968. Noted Derby Works August 1975. Condition July: green livery with small yellow warning panels with curved upper corners, yellow paint covered the frame level stripe (assumed applied by the Works from new). With 5213 allocated to London area depots for nine years its reporting on passenger duties during this time was rare. On October 18th 1969 5213 & 7651 worked a Luton - Brighton football special as far as Acton, here 6552 & 6555 took over. On two consecutive days in late November 5213 worked the regular Brent - Richborough block coal train throughout, Southern Region power was normally assigned to this working. On December 30th 5213 worked the 15.55 Exeter St Davids - Barnstable and the return 17.55 Barnstable - Exeter St Davids. Although allocated to four Western Region depots between January 1972 & November 1977, it was its time at Cardiff that produced the most passenger workings, particularly on the Cardiff - Crewe line. On March 17th 1973 5213 worked the 12.55 Exeter St. Davids - Barnstaple and the diagrammed return. On January 22nd 1974 5213 rescued the 16.30 Paddington - Penzance west of Taunton, dragging 1013 and its train to Exeter St. Davids. During May 1974 two very different passenger workings were noted. On May 11th a Watford Junction - Barnstaple excursion was taken forward from Exeter St. Davids by 25063. The passengers reconnected with the train at Taunton. Eight days later (19th) the Lickey bankers, 25063 & 37217 assisted Class 45 No.69 and the 21.00 Bristol Temple Meads - Glasgow Central up Lickey incline. The first of many passenger trips over the Cardiff - Crewe line took place on February 17th 1975 working the 10.00 Crewe - Cardiff. Condition April: gangway doors still fitted. Another rescue job took place on September 1st 1975 when 25063 & 25153 came to the assistance on the 07.40 Leeds - Penzance between Bridgwater & Exeter St. Davids when 45011 failed with fire damage. On September 7th 25063 hauled 24055/56/60/136 as the 9X75 06.45 Crewe - Banbury – Swindon Works. Another failure on November 14th 1976 saw 25063 assisting a Penzance - Paddington service between Redruth & Plymouth after 50017 failed (see image at top of this page). Christmas at Tyne Yard found 25063 & 25220 (both LA) laying over after they worked the 3E07 21.40 Bristol - Sunderland parcels of December 23rd. Photograph collection of webmaster. Ebbw Junction shed looking westwards with 25063 present. 25063 spent almost six years allocated to the WR depots of Bristol, Cardiff & Laira. 25063 worked a Machen stone train on March 22nd. The Gwili Railway Preservation Society chartered a railtour roundtrip from Swansea to Paignton on September 18th. Motive power provided was 25063 throughout, possibly a first for the class on passenger work at Swansea and a first for the type at Tondu (?). From 1977 until its withdrawal 25062 was noted as a very regular performer on the Crewe - Cardiff services. From time to time 25063 strayed from these services, including trips on the Cardiff - Bristol locals. On August 24th 1977 25063 was noted on the 10.50 Shrewsbury - Aberystwyth. 25041, 25063, 25068 were noted in the late afternoon on Inverness shed on August 9th. 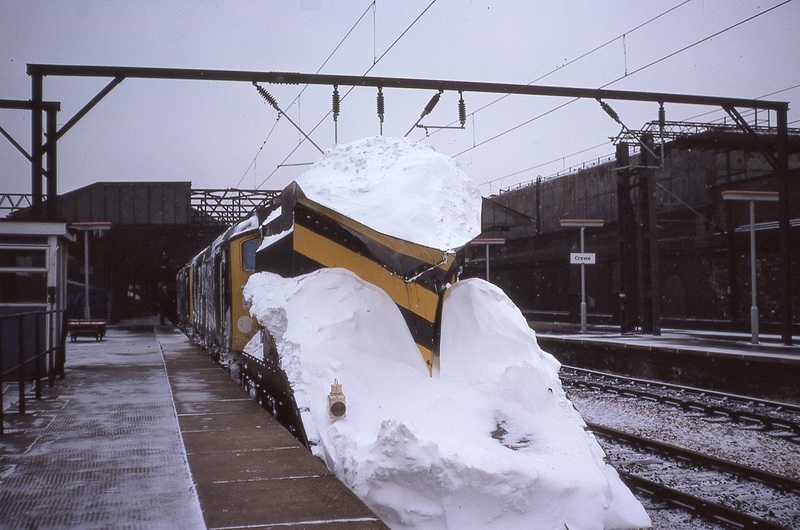 A variety of freezing wintry weather conditions on December may have been partially responsible for multiple failures in the Crewe area, one of which was 25063 hauling the 11.30 Cardiff - Crewe, assistance being provided by 47017, arriving over an hour late at Crewe. On a wintry February 15th 25042 & 25063 were noted passing through Crewe station with snowploughs at each end with large quantities of snow on the ploughs. Photograph collection of webmaster. 25042 & 25063 pass through Crewe station on February 15th with snow covered ploughs. The 17.10 Cardiff - Crewe was worked by 25063 on August 25th, the southbound leg, the 12.20 Crewe - Cardiff had been worked by 40112. The last recorded passenger working for 25063 took place on July 26th 1980 working the 19.28 Crewe - Cardiff. 25063 was withdrawn on November 2nd 1980. 25063 was noted at Cardiff Canton on November 14th. No.2 cab front: two white circles next to the marker lights: January 1978 (but no earlier than the summer of 1977) until withdrawn. No.2 cab headcode panel: non-standard panel, smaller than normal dots: May 1979 until withdrawn. A builders plate from 25063 sold at auction during January 2013 for £250. A builders plate from 25063 sold at auction during May 2013 for £220. Page added April 28th 2013.